...what is your favorite Easter candy? Peeps: I can't eat a whole package of them, but one or two just seem like Easter to me. I am nosy and I want to know...what's your fave? Yes, Peeps are a key part of Easter. We haven't bought any this year, but maybe today. We do make a point of getting a big chocolate bunny, and that we already have. When I was young, the Easter Bunny always included a big (1/2 pound?) filled egg in our baskets. I think mine was coconut and my sister's was peanut butter. I seriously bought every single one of those things on my trip to Targe to buy candy for the 'boys' Easter baskets. 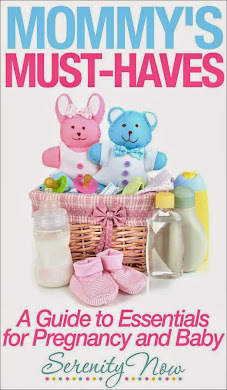 I put boys in quotes because me and hubby will end up eating more of the candy than the kiddos do:) I think my favorite is Peeps, but it has to be the yellow chicks not pink bunnies or purple chicks! Not sure I've ever seen Peeps in Canada. Now mind you, I may just not be hip with all the sugary goodness of Easter. My fave, Cadbury Eggs. Yes, its slightly disturbing to make the inside of a chocolate egg look like a raw egg, but its just oh so good! Used to be a fan of the Peeps but love York peppermint patties and rolos. 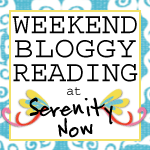 Hope the Easter bunny has been reading your blog! I'd go for jelly beans & chocolate bunnies any day! I have to have a cadbury egg every easter! It just wouldnt be the same without them! Peanut Butter eggs for sure!!!! And jelly beans! Definitely the Reeses eggs - there's nothing like them. I love Jelly Belly jelly beans as well. Yum! Reese's peanut butter eggs are to die for. And almond M&M's. You only see those at Eastertime--maybe because they're sort of egg-shaped? I don't know. But I do love them. And I'm a Skittle fan, too. Oh, gosh. There's hardly any candy I don't like. I'm with you on the Peeps--don't want a whole package, but Easter wouldn't be Easter without a couple. My middle son insists on yellow chicks, thank you very much. No other color or animal will suffice for him. Cadbury eggs are far yummier than they appear, but the real obsession is the Cadbury mini eggs. If you've not tried them, don't!! Addiction material for sure. I can't keep them in the house, or I'll eat a whole bag in a day. (These are the ones with the crispy outer shell and chocolate in the middle-not the mini version of the cream eggs) Happy Easter! did you get my email for the ad? Chocolate covered marshmallow bunnies.... love, love, love them!! 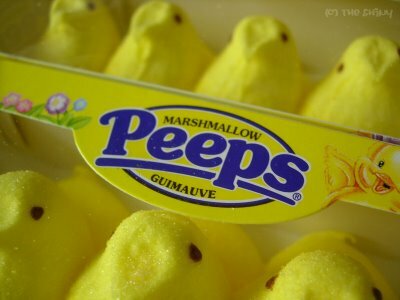 I can't eat any of these things until Passover is over, but I love Peeps and the Reeses eggs! I've also been looking for the Cadbury mini eggs for about a month now and haven't found them yet! I don't do the creme ones, just the minis. YuM! Cadbury mini eggs are my absolute fav!! I have to be honest here - I have never had a Peep. So my favorite is the Cadbury malted chocolate balls. They come in a small purple package. The Starburst Jelly Beans are good! My absolute favorite (non-chocolate) candy, though, is Jelly Belly jelly beans. That's not specifically Easter, though. I have this weird thing where I think it doesn't count as candy unless it has chocolate in it. My FAVE of any candy is Kit Kats. I swear they have crack in them!!! I CANNOT eat less than 7 or 8 minis. Same thing for Reeses - crack! YUM! I think I'm gonna go steal one (or 7) out of the Easter bunny bag. No wonder I can't take off this 15 pounds! Cadbury caramel eggs and Hershey's marshmallow eggs - I cannot stop buying them. Yellow Chick Peeps very stale and hard! I think we're on the same page here! 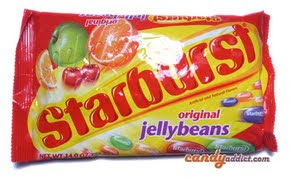 I love the Starburst beans... why can't they sell them year-round? Oh, and don't get me started on Reeses eggs, Reester bunnies, mini eggs, etc... I'm dying to have some on Sunday (I gave up chocolate for Lent). Last year, my thoughtful boyfriend bought me a basket full of them and gave me three of the giant-sized eggs! If you insist on knowing, I'll take a basket full of Reese's eggs thank you! Have a wonderful and Blessed Easter Amanda. I honestly think that the Reese's PB eggs are on my list of what three things would I want if stranded. LOL I also love the Cadbury Caramel eggs! My very favorite would have to be jellybeans. Jelly Bellies are my number one pick followed by Starburst. That's pretty much what I want. I buy Reeses's PB cups, York Peppermint Patties, Dove chocolate, Whoppers, and Peeps for Mr. SP. I'll get into his basket when I need a chocolate fix. Oh, I forgot a candy that I love... butter mints. The Easter Bunny used to always bring those when I was a kid. Cadbury Creme eggs are my all time fav. I gave up sweets for lent and I can't wait to dive into one on Sunday!